Lenovo announced its thinnest business laptop ever, the ThinkPad X1 laptop, designed for mobile professionals who demand the best in performance, mobility, entertainment and style. Complementing Lenovo’s recent “For Those Who Do” global brand launch, the ThinkPad X1 laptop is a strong addition to the ThinkPad X series lineup. Drawing upon the ThinkPad heritage of innovation, the ThinkPad X1 laptop meets military specifications and provides rock solid performance in any environment. Features and specifications are built to ensure rich function and configurability to drive down immediate and long-term costs while empowering employees to be more efficient and productive. The ThinkPad X1 laptop incorporates several features new to the ThinkPad X Series family including a 13.3-inch super bright infinity screen made of Corning® Gorilla® Glass, RapidCharge battery technology, a Dolby Home Theatre multimedia feature, and a backlit keyboard. As the thinnest ThinkPad, the ThinkPad X1 laptop measures less than 17 mm. Packed into the ultra-thin form factor are 2nd generation Intel Core processors which are typically offered on Lenovo’s larger 14 and 15-inch laptops. This allows the ThinkPad X1 laptop to double the CPU performance and quadruple the graphics performance of the ThinkPad X300, Lenovo’s previous flagship 13-inch laptop. Starting at only 3.7 pounds or 1.72 kgs, the ThinkPad X1 laptop feels incredibly light and sturdy thanks to its interior roll cage and magnesium chassis. The screen uses Corning® Gorilla® Glass for extra durability, rigidity and scratch resistance. The hardened ThinkPad X1 passes eight military specifications so that mobile professionals can work anywhere with confidence. The ThinkPad X1 laptop debuts Lenovo’s new RapidCharge battery technology that charges a battery to 80 percent in just 30 minutes. This technology charges 2.5 times faster than a typical ThinkPad battery, giving users more freedom to work on-the-go faster. RapidCharge combines fast charge cells with a 1,000 cycle battery designed to last three years. Users can also opt to purchase a RapidCharge external slice battery for the ThinkPad X1 laptop to double their battery life to 10 hours of battery life. It also affords battery savings of 30 percent when used in Low Power Multimedia Mode to play music, movies and more. And with Instant Resume, users can keep their wireless connection, whether its WiFi or mobile broadband, even when the laptop goes into sleep mode, up to 90 minutes. Lenovo has thoughtfully modernized the keyboard’s appearance while simultaneously retaining the touch, feel and function of the classic ThinkPad keyboard experience. The simplified design eliminates some legacy keys like SysRq while keeping rich functionality including dedicated multimedia and voice calling controls. For working in low light, users can turn on the keyboard’s backlight available for the first time on an enterprise-class ThinkPad laptop. Additionally, in keeping with ThinkPad tradition, the keyboard features spill resistance. Business PCs typically aren’t known for their audio/visual experience, but the ThinkPad X1 laptop changes that with its rich and resonant sound thanks to Dolby Home Theatre v4 and superbright (350 NIT) high-definition display. Whether listening through headphones, built-in speakers or a connected home theater, users will experience a captivating entertainment experience. Also, with the laptop’s HDMI port and Intel Wireless Display technology, users can choose to connect or stream 1080p wirelessly to a TV or projector. 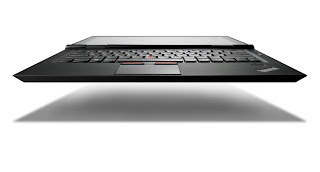 Lenovo’s ThinkPad laptops feature a platform of new innovations that respond to key business needs including: video and voice calling, enterprise management and an easy-to-use computing experience. Using its optional mobile broadband 720p camera, high definition microphones and advanced calling modes, the ThinkPad X1 laptop delivers clear video calls. It also offers robust layers of security with optional Intel vPro technology, encrypted hard drives with remote management support and a fingerprint reader with one touch swipe for power on and authentication.